Webb: Well, it came and went; the last multi-sport race of the season for us. Probably. It has been an interesting and educational summer for us. The idea was to go short and get fast. We did that, but not without encountering some obstacles. 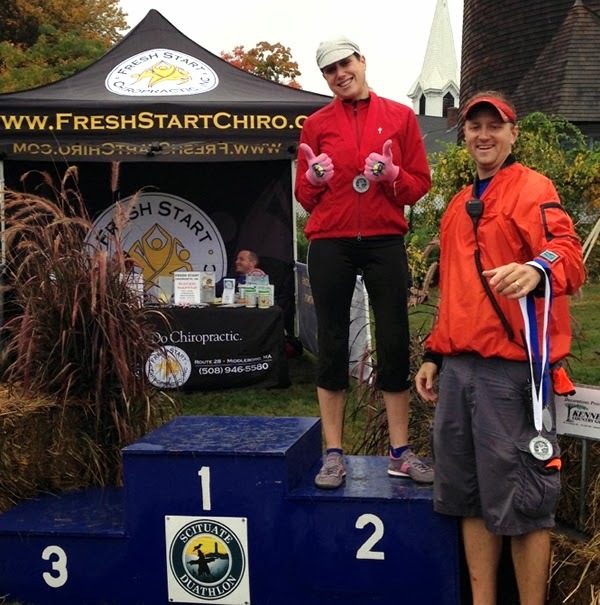 Between Elle's April knee surgery delaying her race schedule and my (in hindsight) foreseeable back injury, our races did not quite go as planned. That's ok. I believe it was a successful year both quantitatively (podium trips and PRs) and qualitatively. Elle: It was my most challenging season, for sure. Not just the lack of training due to the knee injury, then the 6 weeks of little to no activity after the surgery. Then the bike crash just as I was getting back into things. And then the oral surgery. It was kind of a miracle that I was even able to race this year. But even with a season where I didn't truly start training until mid-June, it's true what they say: It's not where you start, it's where you end up. Webb: I thought it was the journey, whatever. Elle: Even with my super short racing year, I'm glad the post-season is here. I certainly won't miss getting up at the crack of dawn, that's for sure. But the good thing about a duathlon - no chilly swim start! And thank god, because we woke up to a cold, cloudy morning. We had a quick, easy drive down to Cohasset and parked at Lenny's house. I was trying to keep a positive attitude about the weather, but just as we were getting ready to bike over to the race site, it started to sprinkle. The forecast said we'd maybe have a shower that would pass, so I didn't let it get me down. We had a nice half-hour ride to Scituate. As we were picking up our race packets, the rain started to fall a little more steadily. Oy. I had packed some extra trash bags, so I put my bike shoes in there in an attempt to keep them dry. Ha, what a joke. Luckily one of the nice 'swag' items in the registration tent were running gloves, that was a nice touch. Webb: There was a buzz of energy about the weather and when it would pass. It didn't bother me. I often look at rainy race days as an advantage. First, I enjoy running in the rain. It helps keep the heat away. I'm also not afraid of wet roads. I'm not daring or fearless; I definitely have respect for the consequences of an unseen oil spot or pot hole in a puddle. I just don't let myself get caught up in a timid mindset. It is possible to ride smart and fast. And then I saw Kim, of bloody Escape the Cape fame, and local elite. It's an odd day when Kim doesn't take first. So at that point I knew who would be winning the women's race. And she's in my age-group, fantastic. Even during the pre-race meeting, when everyone was huddled under the registration tent, trying to stay warm and dry, there was Kim, out on the grounds, running around, continuing her warm-up. Gawd I wish she wasn't in my age group! Webb: I did not know what to think race morning. Before I hurt my back and was doing hard run workouts regularly with SEAC>Elite, I set my goal at one-hour. I had looked at prior years and knew it would be tough. Some familiar names had run just over an hour there. These familiar names routinely beat me. I decided to stick with my goal. Pumpkinman had yielded a surprising PR. In my mind, I saw neither a benefit to limiting nor placing unrealistic burdens on myself. One-hour would be my goal with the full knowledge that I was asking a lot. The first big chunk of the race is downhill. I mean we ran downhill for a long time. I let gravity do most of the work while being sure to keep my feet under me. I passed a lot of guys in the process. We finally hit the base, turned right and started a gradual climb. As the climb became more steep in an undulating sort of way, some guys passed me. Then we'd hit a downhill section and I'd return the favor once again. At some point, one of the women passed me. I'm not sure where we were in the race, maybe 1.5 miles. It felt good because I had honestly expected to be passed much sooner by the faster women. And then all of sudden I saw the T1 arch up ahead. I saw the clock and immediately made a note to myself: There is no way that was 2 miles. Elle: I planned on running the first run leg fast. So I got right up at the front. The "gun" went off 2 minutes after the men, and we were off, all the women. I stayed up there with the faster women, and eventually we caught up to and started passing the men. I have to admit, that feels good. I felt strong. But this was my first duathlon, so I didn't really know how it was going to play out. I just knew, with a race this short, I had to go all out the whole time. As I ran into T1, the rain had started to fall more steadily. And, how lovely, it had formed a little stream that ran through half of my transition 'mat' and soaked almost everything on it. I flung my running shoes down, threw my bike shoes and helmet on, and ran out of T1 ready for the bike leg. Webb: This is a somewhat challenging course. I continued my trend of racing without a computer. The plan was simple: Pedal hard and try to leave just enough in the tank for a short, hard run. Straightaway I passed a few guys. Coming out of T1, I saw Kim right behind me. I kept expecting her to pass me. I put in a good hard effort in the first mile to set the tone. Moving along the wet roads, I kept my one-hour goal set firmly in my mind. Even though I felt pretty good, I still expected Kim to pass me soon and Lenny to catch me eventually, even though his Di2 was malfunctioning and he was in single-speed mode. About half way through, Kim caught and passed me and I rode on as if Lenny were breathing down my neck. Shortly thereafter I passed the one woman who had caught me on the run course. It was around this point that I fell into a rhythm with one guy in particular. We were working together up until the last half-mile or so when I let him go. A glance at the T2 clock told me I had my work cut out for me if I was going to hit that one-hour goal. Elle: Having not previewed any of the race course, my goal was to average 20 mph on the bike. Why? No reason. But with the wet roads and getting slowed down by cars a couple of times, that just didn't happen. Meanwhile, a small pond had formed in each of my shoes. Now I (and everyone else) was full on wet. Webb: What is worse than putting on soaking wet shoes? Ok, lots of stuff. But it is pretty bad, even during a rainy race when you are already soaked to the core. My tired and heavy legs carried me out of T2. The course, coming out of the side opposite to the first run leg, also had an initial descent. I was tired but still under the belief if I ran hard I had a chance at meeting my goal. The guy I worked with on the bike actually came out of T2 after me. I know because he passed me around the 1/4 mile mark. I tried to keep pace with him but he was just too strong. The road flattened out and I wondered when it would go back up again. I'm not sure where we were on the course because there weren't any mile markers anywhere. The course turned right and started ascending. Up it went. Then up some more. And up a little more. As my legs swelled my lungs shrunk. Even though I was struggling I could see I was gaining on someone. I was so focused on his jacket that I didn't notice the two guys coming up who cruised passed me. I kept thinking, we've got to be close - where the hell is the finish line? The course hit the summit after what I would guess was a 3/4 mile climb. We weren't done yet. There was still another half-mile or so to go. I tried to catch the four guys who appeared to be in striking distance. I caught one. My finish time was 1:03:24. Clearly, I was well off my goal time. That was fine. The goal may not have been achievable and I know I gave it everything. The strategy was also fine and I believe I executed well. Quite simply, I did not have a one-hour effort in me for that course on that day. Elle: I was glad to be heading into T2, but putting my water-logged running shoes back on felt pretty rotten. I had no idea where I was in the rankings at this point. 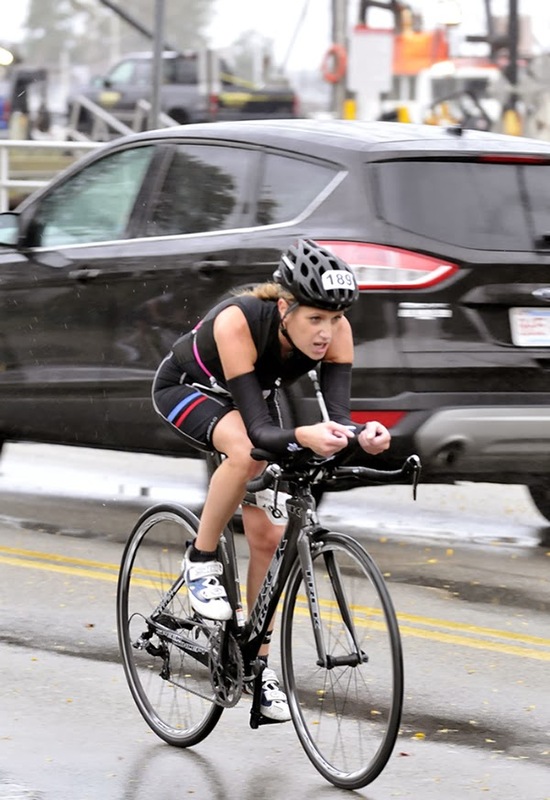 But as I exited T2 I was right behind a very athletic looking woman who, for some reason, I had a feeling was in my age group (by the way, they didn't put ages on our calfs for this race, I don't know why). I chased that woman the whole way. I'd get close, then she'd get away from me. Did she know I was back there? I tried to put it all out there but I didn't catch her. Could I have run harder? I don't know. At the time I felt like I ran as hard as I could, but I'm still learning how to leave everything on the race course. Webb: My pre-race who cares about a little rain-attitude was quickly replaced with I'm freezing and would love a hot chocolate. I drank two bottles of water and headed for the results truck. The timing company (All Sports?) has live, streaming results on their truck on site. It didn't seem like Elle and Lenny had finished far behind me, so I figured all of our info would be bunched together. I found my name and saw that I finished 3rd in my classification. That didn't seem right. 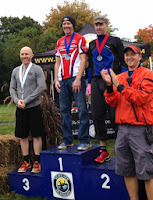 I've knocked on the door of few podiums (podia) in sprint triathlons, never a duathlon. I'm a relatively faster swimmer than runner. I asked Lenny to tell me what it said. He immediately congratulated me. I tempered my excitement because the live results do not include penalties. I could move up or down. Next we checked Elle. Ohhhh, cue the sad trombone. Webb is on the podium! Elle: Webb broke the news of my results: 4th in my age group, 7th overall woman. I have to admit, I was pretty bummed out that I didn't place. I felt like I had raced well, I went out hard and thought I had finished strong. But you can't control who shows up to the race. I mean, Kim will always be in my age group, and she's always going to beat me. 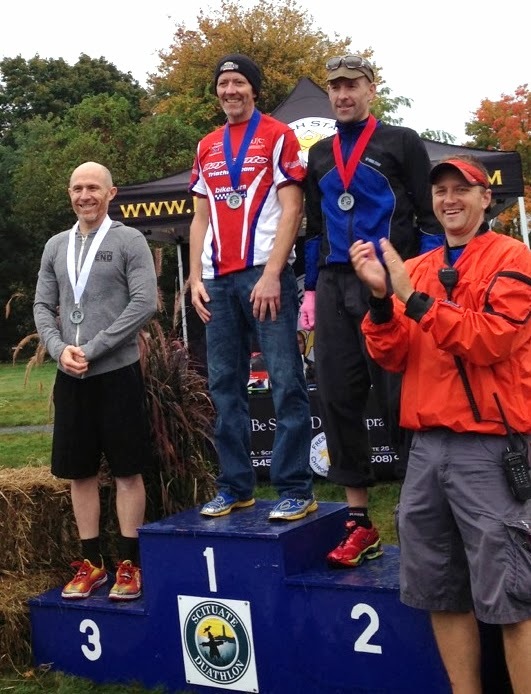 But it was my first duathlon, and, HEY! Webb placed! So I focused on that, which is pretty cool, since it was a tough field of men racing out there, and especially in his age group. Yay Webb! Webb: This was my first podium if we don't count a high school track meet where I entered the pole vault competition because there were only two guys in it. No, wait, I finished 4th. There were two guys from my school and one guy from another team. were overall winners (Kim and another woman), so they were taken OUT of the age groupings, which pushed little 'ol me up to second in my age group! Don't ya love how they do these things?!? A good way to finish the 2013 multi-sport calendar. Hellooooo off-season!